Today is my birthday. I'm turning 59. After barely surviving cancer a little over a year ago, I celebrate each day, and birthdays are even more special. Celebrate life with me today! 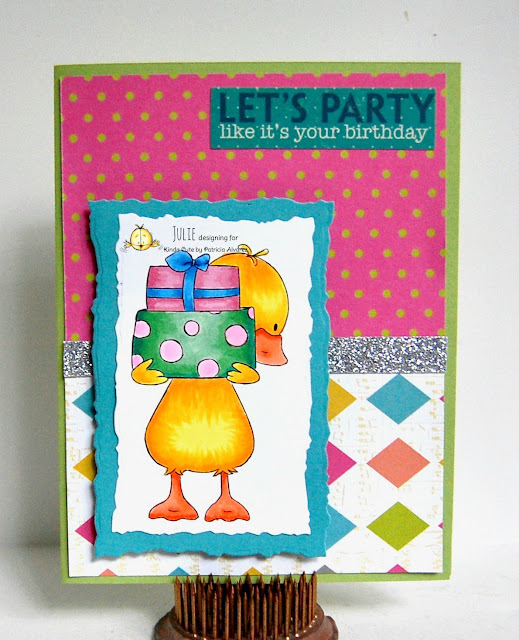 I thought this cute Duck with Presents was the perfect stamp to have on my blog on my birthday. He is spreading joy for sure! I colored Duck with Presents with Copic markers, then used my new frayed edge dies by Taylored Expressions to back and layer the image. Check out the blog, Kinda Cute by Patricia Alvarez for great inspiration using more awesome acrylic and digi stamps from Kinda Cute by Patricia Alvarez. There's also a Facebook group with a monthly challenge you'll want to check out. You'll find that here. The challenge for this month is just getting underway, so check it out! Oh Julie, I'm so sorry to hear about your battle with cancer!!! Congratulations on beating the beast, and not only surviving the battle, but celebrating the joy of life! Your 59th birthday is so much more than a celebration of your birthday after that battle! HAPPY BIRTHDAY!!! I pray you see 69, 79, and 89 with as much vigour!! Happy belated birthday Julie!!!! This card is wonderful. 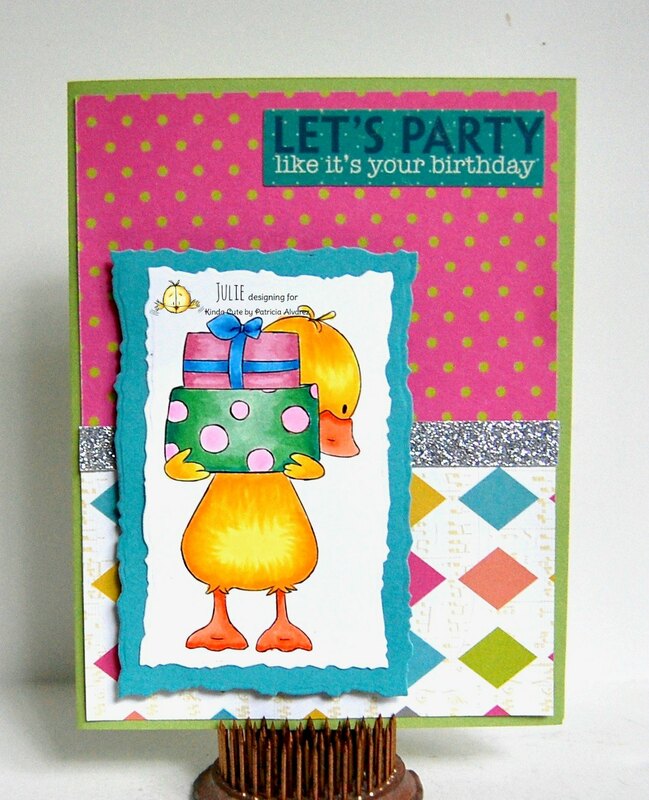 Love the duck and the bright colors. I will be turning 50 in just a couple of weeks. Happy Birthday Julie , fab card, Thank you for sharing with us at DIGI CHOOSDAY this week. Fab card - love the colours. I Love to be Carefree! Celebrate! It's almost Independence Day! Warm Wishes -- We Are 3 New Release time! !